recently moved back to our home county of Cumbria after living in Sheffield for 15 years. Our style of photography is to be very natural, relaxed and unobtrusive, allowing you to enjoy your wedding day and capturing those natural happy emotions! Helen is a bit of a self confessed romantic – she loves the little moments like the father seeing the bride in her dress and the groom turning around to look as his beautiful bride walks down the aisle. She is also an expert on knowing how to put on a buttonhole and prides herself on making everyone feel at ease during bridal preparation. Paul is a bit of a photography ninja – he like to makes sure he can capture moments without knowing he was there – even if that’s jumping into a bush of nettles! 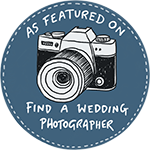 We work together well capturing your wedding day from two different angles and making sure you enjoy your wedding day whilst capturing all the natural emotions, laughter and tears. We absolutely love our job and feel it is a real privilege to be a part of such a special day. In our spare time we love to head out to the Lakes for a wild swim or boating with our little boys Stanley & Albert. We also like to sample coffee shop cakes and hunt out bargains in charity shops!